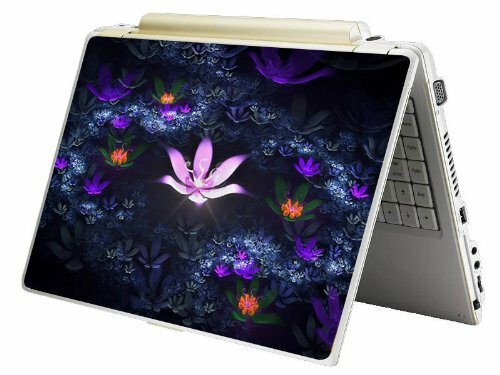 These design skin stickers fit most NETBOOK (mini laptop) from 7in to 10.2in wide screen. Dimension of our skin is approximately 27cm (10.5 in) x 17cm (6.7 in). Recommended to measure your netbook prior purchase. Simple trimming instruction is included. Skins are made up of ultra thin and supreb vinyl material that is environmental friendly with an upscale leather-like finish to distinguish your laptop (See closeup shot image). Prevent abrasions & scratching. Highly durable, dustproof & waterproof. Skins are made up of ultra thin and superb vinyl material that is environmental friendly. These are NOT hard case or faceplate. Fits well into most accessories and case & no hassle removal. Will NOT leave any sticky residual upon removal. Dimensions of our skin is 27cm x 17cm (10.5 in x 6.7 in). Fit netbook from 7" to 10.2". Please measure your netbook first to avoid returns. Cut-line and step by step instruction included. These skins can be easily trimmed with a razor blade. For smaller size netbook like 7 inch, a little more portion of the design will be trimmed off. Recommended to select design patterns that focus in the middle. The designs are lovely and the quality is great. But if you're buying this, you gotta measure your laptop/netbook VERY carefully. I bought this for my Dell mini 10. Length-wise it fit fine, but it was about a centimeter too short from top to bottom. It's fine for me since I'm using this as a scratch protector/personalizing thing.